Having lived in Japan for a couple of years, I keep my eyes out for any snippets of Japanese language in the UK. Given that there aren’t very many Japanese people living in my home town, you might not expect to come across many, but Japanese keeps popping up – usually in the most unexpected places. 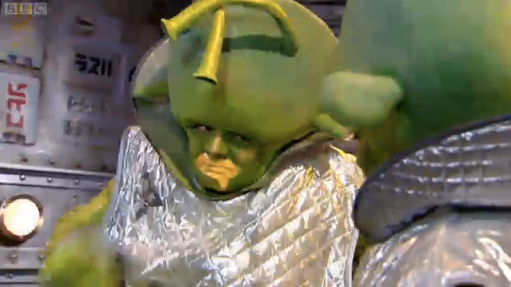 Take a look at this photo of two aliens, from the BBC’s children’s TV programme, Dani’s House. Various parts of the spaceship are labelled with characters from Japan’s Katakana script – chosen presumably because its angular shape has a ‘futuristic’ appearance. The black characters read ラス (pronounced ‘rasu’) – followed by a third symbol that seems just to have been made up – though it could be a stylized リ. When I was out shopping in Newcastle upon Tyne, the following sign caught my eye. Ostensibly it welcomes visitors from around the world to Monument Mall shopping centre, but is it really there for the benefit of shoppers from overseas? Perhaps its real purpose is just to add a bit of a cool international flavour to the mall. I very much doubt that the centre’s managers are aware of how much amusement the sign has given to those in the know – quite a few passers-by have had a good laugh after noticing that one of the characters in the Japanese phrase いらっしゃいませ has been stuck on upside down. An additional bonus for French speakers is that they’ve used the wrong grammatical gender. That’s all I’ve found so far – but I’m keeping my eyes peeled for anything else. 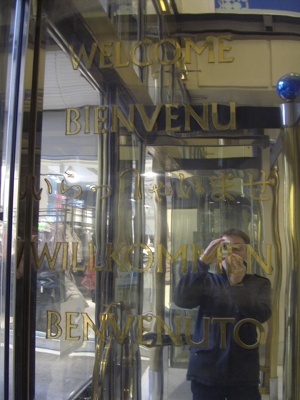 And here’s a chance for you to get involved – if you come across any other examples of 変な日本語 anywhere in the world, please take a photo and send it to Mike@UnmissableJapan.com so I can put it on this page. I’m really looking forward to seeing what you can come up with.